Often hilarious, thought provoking or emotional charged, TED Talks gather some of the funniest, wittiest, smartest and most inspirational individuals to give talks on subjects they feel passionate about. Launching back in 1984, there have been over thousand different talks given to have people laughing, thinking and crying. Fortunately, we have saved you the trouble of ploughing through all of them and have picked out ten TED Talks that will leave you feeling different after you finish watching them. One of the most widely watched and popular TED talks, Sir Ken Robinson’s entertaining, witty and extremely compelling talk looks at the somewhat disparaging effects school systems have on children’s creativity. When listening, it is very difficult not to draw very real comparisons with your own educational experiences. In this extraordinary talk, MIT researcher Deb Roy offers an unbelievably insightful and candid look into his family and his child to show how language develops and is effected by the surrounding around his son. He then shows stunning parallels with the rest of the world. With mind boggling data combined with a heart touching personal moments, this is one that will leave you both scratching your head and rubbing your eyes at the same time. When the man who brought the world ‘Supersize Me’ was invited to do a TED talk on the world of branding and advertising, you could be almost 100% certain it was not going to be conventional. Using his unique style of humour and brilliant delivery, Morgan Spurlock uncovers and examines the often hidden world of branding, sponsorship and advertising and questions what defines you as a brand. 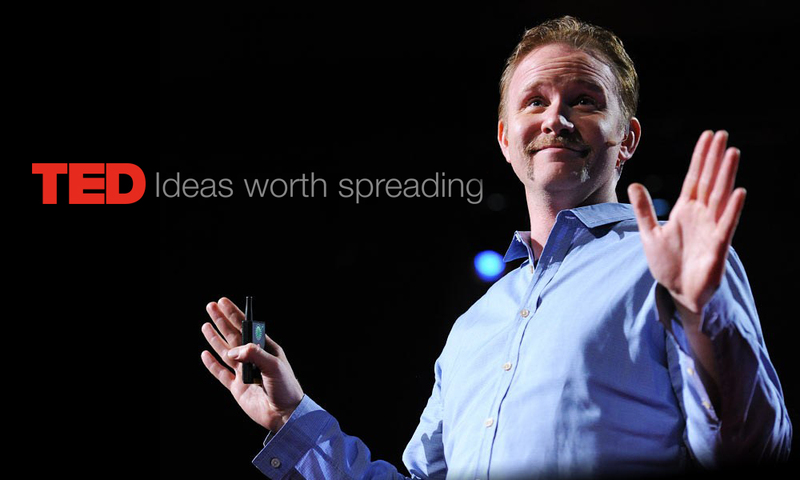 Given the current situation in the Middle East and attacks seen in Paris, this TED Talk seems particularly relevant. Zak Ebrahim is the son of a convicted terrorist who planned the 1993 World Trade Center. He talks openly about his extremist upbringing and how his own life experiences have allowed him to chose his own path. Powerful, intriguing and insightful. Beau Lotto’s captivating talk aims to open your eyes to the truth about how we see. Using optical illusion and colour games, he shows how much your brain and your surrounding influence your perception of colour. Fun, entertaining and at times mind blowing, this TED talk will probably leave you with more knowledge on how your brain works than two years of secondary school science. As humans, we like to think we know all there is to know about the world. David Gallo reveals that there is still so much to learn, and a lot of this exists in the sea. David takes us through an exploriation of some of the most incredible creatures that we share the planet with and how their evolution has led to astonishing mechanisms for survival. Certainly worth waiting for the big reveal at the end. In a world that seems to value and push people to be more and more outgoing, Susan Cain looks at life through her eyes; the eyes of an introvert. In her passionate talk, she discusses the benefits and value of being introverted and highlights that rather than something that should be shamed and discouraged, it should be embraced and celebrated. In this useful talk, Julian Treasure gives some expert tips and advice on ensuring that what you say engages people. Using pitch, tone, inflection and some rather unique voice exercises, Julian shares the importance of good communication and what affect and impact our voices have when trying to convey messages. In Larry Smith’s blunt talk, he calls people out for all the excuses used to stop people from pursuing their passions and achieving greatness. Hate it or love it, it is hard not to feel motivated to go out and create something incredible. Birmingham artist Willard Wigan reveals a micro-world unknown to us. Sharing his experiences from childhood and taking us through his intricate, painstaking artistic process, we see how he creates microscopic worlds and how this process has shaped his outlook on life. Working between his heartbeats and designing a house on a pinhead, Wigan’s is a fascinating story. Have you got a favourite that we have missed? Let us know in the comments below. Unaerpllaled accuracy, unequivocal clarity, and undeniable importance! nice one for the brilliant content on your website, I am very curious in this story and you have really helped me. I have just told a few of my friends about this on FaceBook and they love your content just as much as I do. Voi ettÃ¤ teitÃ¤ ihania!!! Tulinpa iloiseksi tÃ¤stÃ¤ vastausryÃ¶pystÃ¤ 🙂 Arvelin tÃ¤tÃ¤ kirjoittaessani, ettÃ¤ tuskimpa kukaan muu on ollut yhtÃ¤ hÃ¶pÃ¶nÃ¤ kirjoihin kuin minÃ¤, mutta toisin kÃ¤vi! Ihania olette ♥Mervi; mÃ¤kin luin kyllÃ¤ kaikki mahdolliset sarjikset – kuten sanottua, ne kirjat alkoi kÃ¤ydÃ¤ vÃ¤hiin, kun olin semmoinen lukutoukka. Mun ehdottomat suosikit oli Marsupilami ja Lucky Luke! Qu’il est bon ton texte! Ã‡a reflÃ¨te tout Ã fait mes pensÃ©es! Bravo d’Ãªtre capable de mettre en mots ce que nous, les parents, vivons. moodie: aiya…try joining the festival celebrations at least once. white fish with firm meat shd be fine but i really don’t know what’s safe to eat raw. ask ur fishmonger, or use sashimi-grade salmon? ?lilyannette: will u be cooking it? tell me how it turned out, n what fish u used. the pic was taken a year ago with my little canon. ur pics r always beautiful. hey, i’m linking u–u frm sabah? ?pp: oh yes, u’ll enjoy the festival. hey, try making the hinava, really, it’s yummy. for the all people that are unemployed and not listed on the unemployment insurance list…….should be just as easy to dispatch them out to jobs too……remember…bills need to be paid monthly….and so jobs need to be had for the bills to be paid…..and..we all know where the bills come from…..